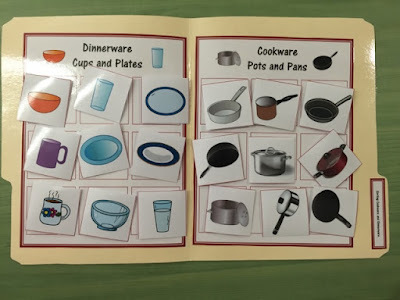 It can be hard to teaching cooking skills in special education classroom, especially if you don't have a kitchen! 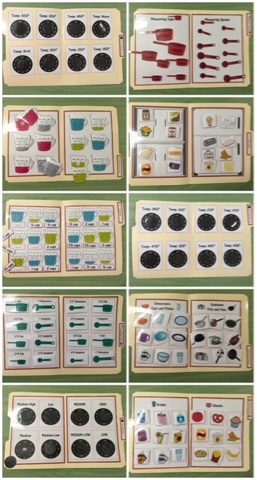 I mentioned before how I love "tricking" my students into learning by working on concepts using file folders. They still seem to think they are games! Or at least they enjoy them. Some of my students will even choose to do file folder activities during their breaks. 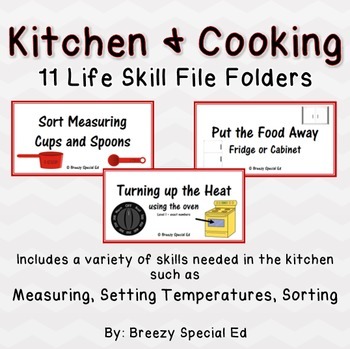 A lot of file folders that you can find online are for basic facts, such as colors, counting, and what-not, but my students need to work a lot more on life skills that will help them become successful as young adults! 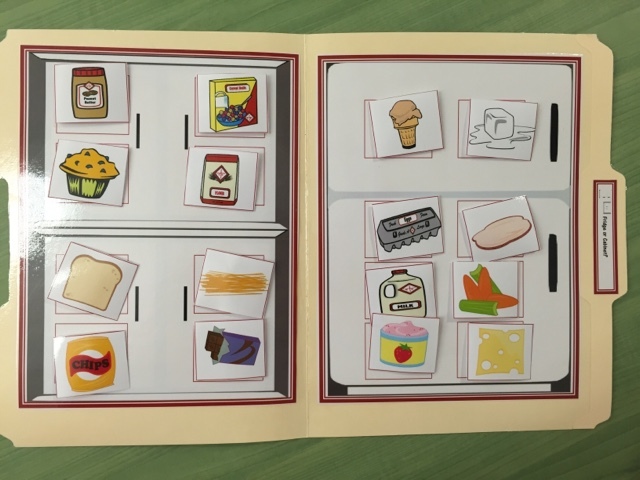 So I created this set of file folders based on all things cooking and around the kitchen. I also include a variety of difficulty levels in my file folders so that I can appropriately challenge each of my students. First, we have a simple file folder that works on sorting measuring cups vs. measuring spoons. 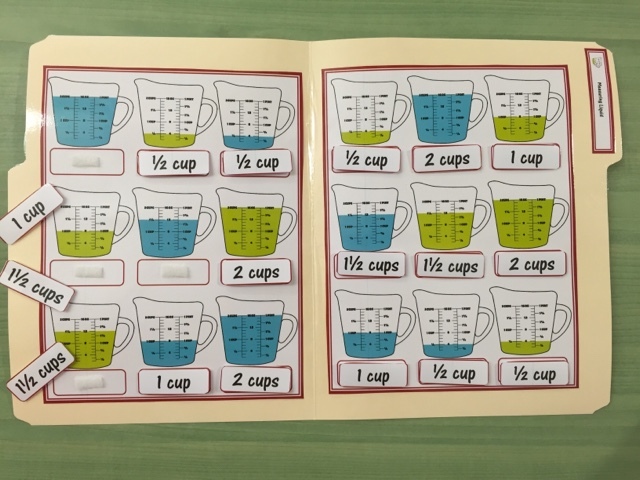 Then, this file folder works on students reading the label and finding the correct measuring cup or spoon. 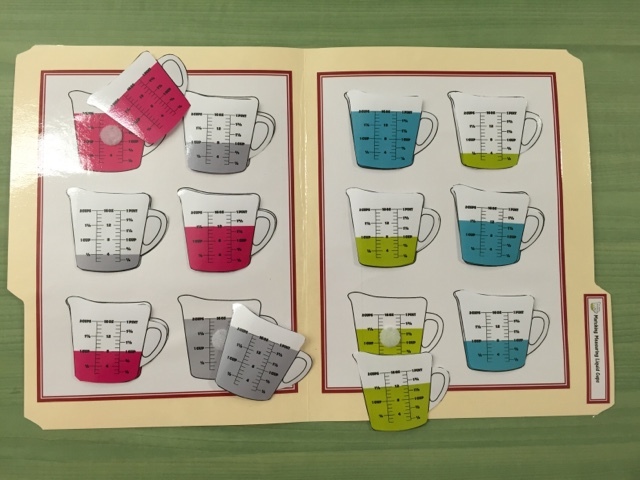 Now onto liquid measuring cups. This one is more simple, matching liquid colors and amounts. 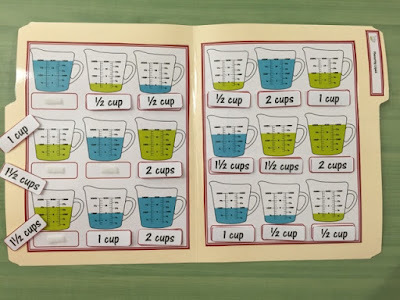 And then it gets challenging, matching the amount to the 1/2 cup as shown on the cup. 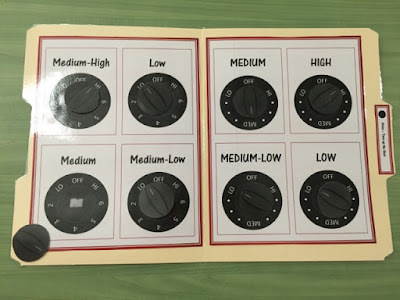 I only have one pictures for you here, but I have four different options for setting the temperature for both the stove top and the oven. There are two different levels for each one, one with exact temperatures (ex. med, low, 350 degrees, etc) and one with in-between temperatures as well (ex. medium-low, 475, etc). You "turn" the knob to match the temperature. Could also be an easier task for student to make sure all of the burners are "turned off" too! 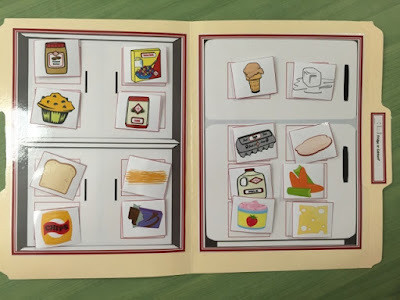 Here's a food sort for what goes in the fridge/freezer and what goes in the cabinet. 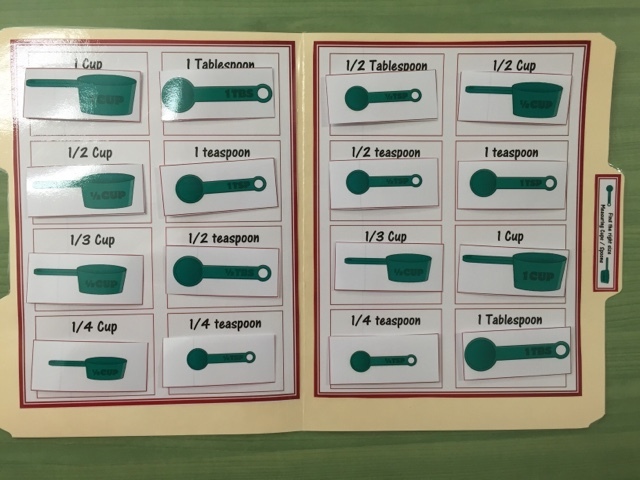 Sorting cups and plates vs. pots and pans. 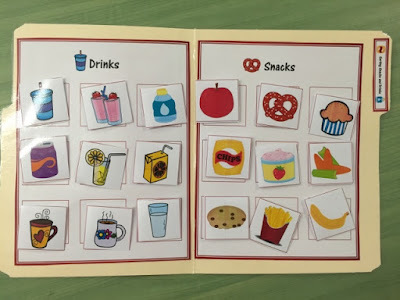 And finally sorting drinks vs. snacks. Aren't those fun? And they work on a variety of life skills as well! You can purchase these in my TpT store here. 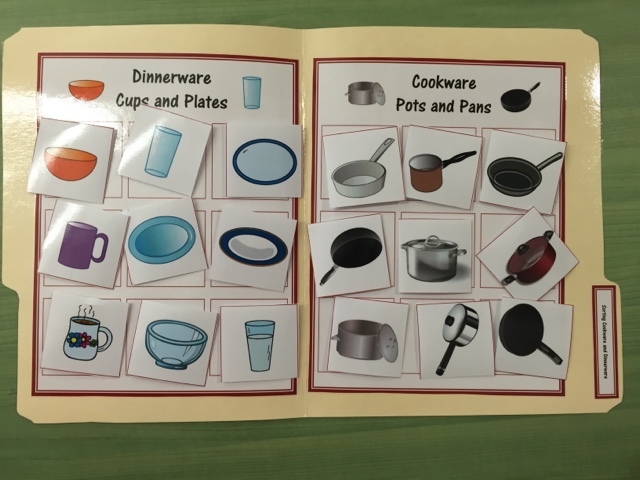 Want even more life skill file folders? Check all these out! 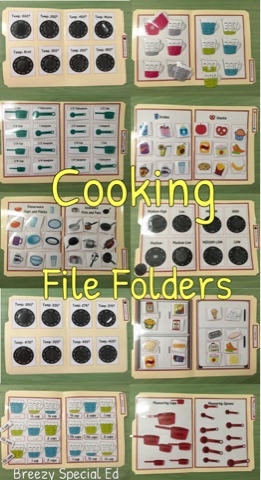 So what do you think, will these file folders help you practice cooking skills in your classroom?! These look amazing! It's so difficult to find tasks that teach cooking skills and could be in a work tasks bin. Thanks for sharing! 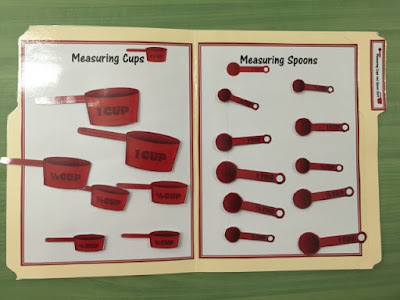 Do you mind sharing where you got your measuring cup clipart? 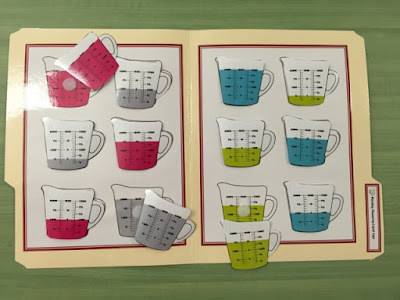 I've searched and searched for clipart with the measurements on the side and can't seem to find any. These are great. Nice work. Thanks for sharing. Brie, these are absolute genius! I love these so much--what a great idea. Sorry I don't gush much--only when I find something really worthwhile! These are awesome! I'm not sure if you still monitor this post, but if you do, I would try appreciate if you could share your clipart as well. I've been looking all over and haven't been able to find any like these. Thank you! Thanks Corey! I actually had to create the oven/stove knob clip art but everything else I found on TpT! Awesome! Thanks for the response. Most of my students are in a cooking class this trimester and I’m excited to put these together for them! Thank you for sharing! I just bought this on TpT!